It’s hard enough to gather information in order to create and maintain an income statement, let alone to research what are included in it. With all the sections included, it is very easy to leave a few to some sections off, and that could be very crucial. There are several main headings and sub-headings which makes these financial statements very detailed, so it is imperative to get some serious help with this financial statement, especially being a business owner. That is where these excel templates come into play. Provided are some excel templates for your business. 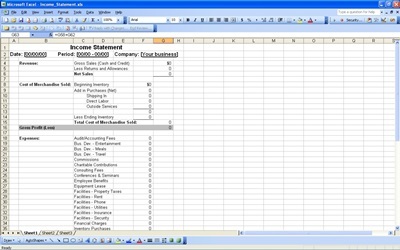 The website, http://exceltemplates.net/financial/income-statement/income-statement/, gives a template for your income statement. This will save you the time and money it would take to research or hire someone to handle your financial statements. That saved time, in turn, could be used for executing more productivity in your business. This free excel template goes into detail of all the expenses, income, taxes, etc. There are several categories and sections that go into areas such as revenue, cost of goods sold, gain or loss, gross profit, net income, etc. However, this excel template serves as an outline for you. It’s very easy to obtain this excel template. All you have to do is download the template. In the website, just click on the word “download” on the left side of the screen, and there you have it. Now, you are ready to fill out your statement. You’ll have nothing to lose, and everything to gain with this system. These templates are free, and save you tons of time as it is already laid out for you. All you have to do is to log in your information into the appropriate areas. Also, it is easily customary for your needs.